The EU adopted a Biodiversity Strategy in 2011, with the aims to halt biodiversity and ecosystem services loss across Europe by 2020. However, the 2015 Mid-Term Review of the Strategy concluded that biodiversity protection is deficient and that, at current trends, the EU will fail to achieve its goal of halting the negative effects of anthropogenic activities on ecosystems by 2020. Our previous top-down analysis (Rouillard et al. (2017), Synergies and Differences between Biodiversity, Nature, Water and Marine Environment EU Policies) found that at the EU-level, sectoral policies support drivers of biodiversity loss, reducing the potential effectiveness of the EU’s environmental policies. As a second step, we conducted a bottom-up policy analysis for the eight AQUACROSS case studies, in which we investigated whether the same is occurring at the local level. We undertook an in-depth review of relevant local policies for each case study and the linked effect on drivers of pressures to the local aquatic biodiversity, highlighting gaps and conflicts in each policy framework. Agriculture: A considerable focus on environmental goals to reduce environmental pressures such as nutrient pollution is required of the local implementation of the Common Agricultural to achieve biodiversity targets. However, cross-compliance requirements within the CAP are currently not implemented sufficiently to ensure that nitrogen pressures from farming reach a sustainable level. Renewable energy: is managed locally as an environmental solution (to exit fossil fuel-based energy sources), while it is rather an operative shift in structure and infrastructure which has the potential to cause pressures such as hydromorphological changes on the aquatic environment. Tourism: is often supported by local policies that mainly focus on increasing economic growth with few environmental safeguards, thereby contributing to the intensification of a range of pressures (e.g., additional nutrient pollution, extraction of species, morphological alterations, invasive alien species) on aquatic ecosystems. In AQUACROSS’s Lough Erne case study, the bottom-up policy analysis showed that the pressure of invasive alien species arriving in the ecosystem through effects of tourism are coherently addressed by a number of local environmental policies. However, several policies and instruments supporting tourism increase the recreational activities in the Lough. For example, the Fermanagh Lakelands Tourism Area Plan aims to increase visits by 17% until 2020, with an emphasis on the need to continue partnerships to enhance water-based recreation. Environmental safeguards are missing to ensure sustainable tourism growth as well as a decline in biodiversity loss by 2020. The full Bottom-up Policy Review of the eight AQUACROSS Case Studies and its Executive Summary are available online. 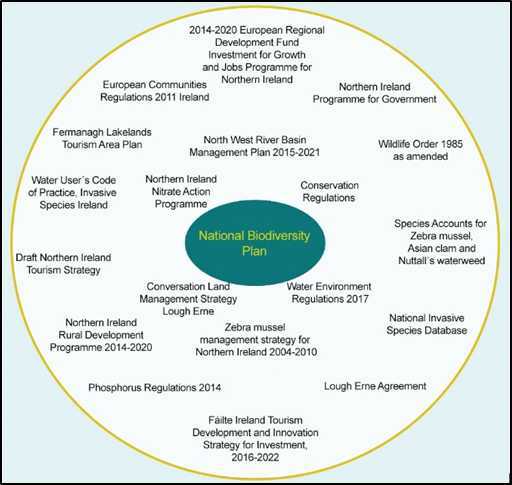 Figure: The complex policy framework surrounding the protection of aquatic biodiversity in the Lough Erne.